I've really let myself go. I'm sitting here with the muscles of my arms and core burning because I did ten minutes of exercises designed for senior citizens. I was doing those exercises to treat some severe back pain. The pain came from me going on a walk with my kids and my dogs. That's right, I hurt myself taking a walk, and I'm too out of shape to do simple stretching exercises. A few years ago, I weighed almost 300 pounds. Unfortunately, I'm not the kind of person who has body image issues, so the way I looked didn't bother me. I have a penchant for Hawaiian shirts and heavier people pull them off better than the thin. But, I felt bad. I was a young father who couldn't keep up with his kids. I worried about dying too young and leaving them. So, I started running and eating well and lost almost 100 pounds. I even ran a marathon. But I let myself get too busy. I work full time, I'm writing a book, I write this blog, I do two podcasts, make liturgies, and travel a lot because people ask me to come speak at events. Trying to do it all left me tired and overwhelmed. There are only so many hours in the day, right? I gave up exercise. I don't weight 300 pounds, but my belly is big enough now that it's tough to button the lower buttons on my dress shirts. Have you ever wondered why change is so damn hard? How does a person have firm conviction to go for a morning workout, also have an equally firm conviction to slap the snooze button a few hours later? How can we want to be thin, and to have pizza for lunch? And what of visions of our calling? So many people know that they want to do a new kind of work, but never find the time to hone that new craft–and yet the time is there to watch the flat, false world on television. Our brains, the complex and messy miracles in our skulls, are to blame. We believe ourselves to be a unified consciousness that makes decisions and takes actions–when in fact our minds are an endless tug-of-war between thousands of conflicting neurological loops and impulses. Our conscious mind primarily lives in a thin layer of brain matter behind our foreheads, fed information and insight by a vast machine father back in the skull. Jonathan Haidt offers a useful analogy in his book, The Happiness Hypothesis. Your brain is like this. Your conscious mind is a rider, while your unconscious mind is an elephant. 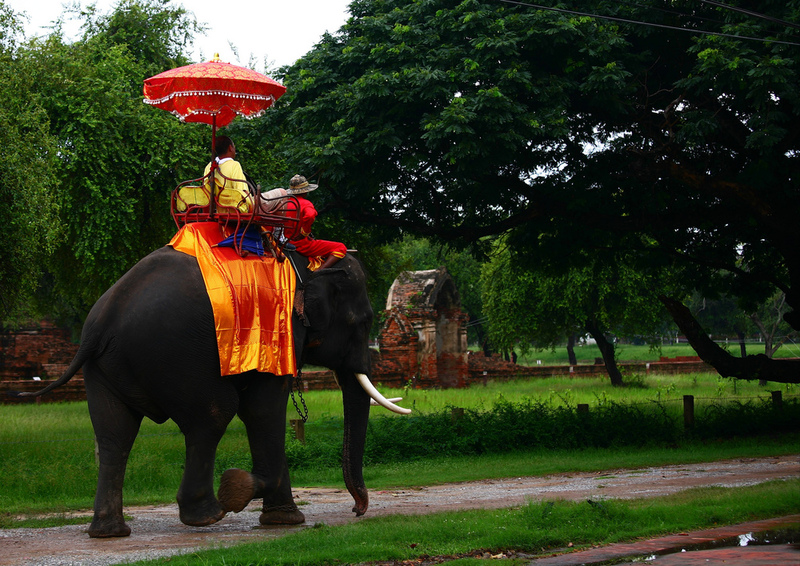 No rider could direct an untrained elephant–humans aren't strong enough to force an elephant to do anything. Elephants are powerful, and intelligent in their own way. They are creatures of habit, who prefer to walk the same paths. The rider may see a promising new path, or far off destination, but the elephant only sees the path it takes every day. Trying to use willpower to achieve resolutions is like trying to force an untrained elephant onto a different path. That's why so many of us fail at change. We tug, shout, and scream, trying to turn toward our goal, but our elephant just walks along the familiar path. So how do we train the elephant? I've found two techniques work well for me: meditation and cognitive therapy. Both involve thinking intentionally over time as a means to change our thoughts and behaviors. There are many forms of meditation–way too many to list here. At the core of all of them is a time of quiet reflection, mindfulness, and peace. I've always been interested in meditation, but only became serious about the practice after becoming an atheist. I've returned to faith, but the transformative power of meditation made the trip with me. Many Christians aren't aware that there's a long standing tradition of meditative practice in the Church. Of course, Christian meditation differs from Eastern practice in significant ways, but it's still a central part of our faith. Science shows meditation to be an excellent tool to reduce stress and increase focus. It's also been shown to help people achieve their goals. If you've never tried meditation, I recommend starting simple. Try to find two 15 minute windows in your day where you can be still and quiet and take these steps. Put your phone on Do Not Disturb. Focus on your breath. Don't control your breathing, just put your attention on it. When your attention drifts to other thoughts or sensations, gently return it to your breath. Focus on God's love. Think about how God cares for you and wants the best for you. This obviously works best if you believe in God. If not, think about how fortunate you are to exist amidst such a vast Universe. Focus on your goal. Pick some scene that excites you related to that goal. For example, if you're goal is to run a marathon, picture yourself running toward the finish line, and someone lowering a medal over your head. Picture your friends and family cheering for you. Whatever you imagine, picture in vividly. Focus on your preparation. Mentally rehearse and imagine the things you need to accomplish to achieve your goal. It may be preparing and eating healthy meals, or reading your Bible every day. It doesn't matter, just take the time vividly imagine taking those steps. When the timer goes off, return your attention to your breathing, and then slowly return your attention to the outer world and open your eyes. You'll probably be amazed how effective this is in helping you train the elephant. Over time, you'll find it easier to act out the behaviors you've visualized in meditation. I went through a dark period as a teenager–bad enough that I was suicidal. A noxious combination of childhood bullying and hormones left me with powerful, unresolved anger and depression. My parents sent me to a therapist and I was mortified by the prospect. The kind, older man I met was not the distant psychoanalyst I expected. We talked, and he gave me a yellow book about Cognitive Behavior Therapy (CBT). He described it as a method of using our thoughts to modify our feelings. As a computer engineer, I have a better description for CBT: hacking the code of your mind. I'm serious. My friend Bradley is a life coach, and he often remarks how quickly I can make changes in my life after we have a conversation–and that's thanks to CBT. I'm not gifted, or exceptional. I've just been practicing for 20 years. Think of the elephant and the rider. Your feelings are with the elephant. Their primarily chemical reactions that originate in the lower parts of the brain, and they are a fast way of thinking given to you by Evolution. When you are startled, all sorts of neurotransmitters and hormones get pumped into your blood and brain matter. It doesn't matter if you were startled by a shadow (false alarm), or a bear (genuine danger). Your hair is going to stand on end, and your cheeks are going to flush. Long after your conscious brain realized everything is fine, your automatic nervous system still ramps up the fight-or-flight response. Anger is like that too. So is sadness. Once the chemical components of those feelings are released, it takes time for them to be processed. Plus, if the stimulus that caused them in the first place continues, your brain will dutifully keep making those chemicals. You'll be mad, scared, or sad for a long time. It doesn't have to be that way. Humans have a remarkable gift. Thanks to the conscious mind (the rider) we have a singular capacity in the animal kingdom: we can train ourselves. That's what Cognitive Behavior Therapy is all about. It's an awareness of this duality between conscious and automatic thought, and a methodology to use the former to shape the later. Here's how it works. First, you learn to observe your thoughts (meditation really helps with this). You've always got an inner monologue, so step back and listen to it. You'll be amazed how it continues without conscious intervention. Just listen. Next, analyze your feelings as well. How are you feeling? How do your thoughts relate to those feelings? I often find that when I'm sad, my thoughts dwell on unfortunate circumstances or personal shortcomings that frustrate me. My feelings encourage those thoughts, and those thoughts deepen the feelings. It's a bad cycle. CBT makes you aware of the feelings, but you don't try to force your way out of them. Instead, you focus on the thoughts. Remember that weight that I'm trying to lose? Well, thanks to all the events I speak at, I get a lot of pictures and videos taken of me. When I see some of those pictures, I'm shocked and revolted at my appearance. Now, step into my head for a second. Where did that giant belly come from? How can anyone take me seriously? That much weight is really unhealthy. Am I going to have a heart attack and abandon my family years to early? What kinds of feelings do you think follow those thoughts? Shame. Stress. Worry. Fear. My limbic system lights up like a Christmas tree, and stress hormones are released into my bloodstream. Not good. Let's see how CBT can help. Step back into my head as I interrupt the inner monologue that I've been observing: I can lose weight–I've done it before. I'm not hideous, and people like me and respect me. I can take actions to become healthier, and to live a healthy life. What can I do right now that would help? And then I take action: a walk around the building, or some stretching exercises. I do some easy action that can foster a sense of accomplishment. That's it. Every time you become aware of negative or self-destructive thoughts, you consciously interrupt that cycle and shift the direction of your thoughts. Here's the amazing thing: in time the elephant follows and your feelings and actions change. You may have to do this hundreds or thousands of times. Often a therapist who's familiar with CBT can help devise straggles just for you and your situation–but it works. It's the most powerful means I know to train the elephant of your unconscious mind. You will fail. It doesn't matter how much you meditate, or how well you master CBT. One of the most important ingredients in life change is coping with the times where you miss the mark you've drawn for yourself. I find it works well to stop and imagine that one of my best friends has failed in the same way toward the same goal. What would I say to them? What tone would I use? We tend to be very encouraging and accepting of our friends, and that gives them the confidence to change and grow. Part of a good meditative practice and part of a successful CBT strategy is learning to treat yourself with the same grace. People are ruthless with themselves. I know I sometimes call myself things I would never direct at someone else: idiot, fool, slug. Those thoughts don't challenge us, they break us down. Build yourself up the way you build your friends up, and you may find that you can achieve your goals and resolutions.